Get the Popular Book Stand! 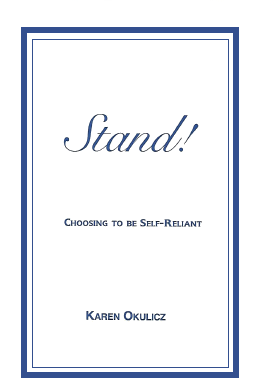 - Choosing to be Self-Reliant. For all other ebook opportunities please go to their websites. We recognize that being present is a powerful tool for self-reliance. By being present and having acceptance, we now will add the awareness that most difficult situations in our lives happen "just once." This "just once" belief may offer comfort in many, many varied and challenging times. This is the comfort of knowing I only have to do this, go through this, put up with this, handle this, solve this, be a part of this, "just once." If I only have to go through this once, I can handle it my best way possible to the final resolution with limited anxiety. Your best way is up to you. Top of the list of "just once" occurrences is, of course, the death of loved ones. When we are faced with the death or dying of our loved ones, the emotions and feelings are so overwhelming, they make time stand still. We can and do get lost in grief as we are witnessing our loved one's passing. We also will be lost for awhile after their passing. A loved one also includes our pets, of course. "Just once" could also be an overwhelming debt, lawsuit, divorce, illness, unexpected caretaking or facing a natural disaster's aftermath. I am sure you have even more examples of a "just once" scenario you have experienced. They may be the incident that triggers us to have to craft our new normal. It seems we all are getting a taste of natural disasters, be they floods, hurricanes, earthquakes, droughts, fires or tornadoes. I cannot claim to know the devastation of losing everything to a disaster. Though I do know what it feels like NOT knowing if you have lost everything. I have been evacuated twice from my home, once for Hurricane Irene and then for Superstorm Sandy. With Irene I had no damage or power lost. For Sandy, I did not know how my home fared. When I received that phone call that said all is well, what a sigh of relief. We could have a "just once" that comes as a betrayal at work or a love lost. There is no hiding from handling a "just once" situation. There it is, present, large and looming and must be taken care of. We may be in a position of having multiple "just once" states of affairs at the same time. We could be caretaking and lose our jobs. You can name a variety of conditions that you have lived through, or are right now living through them. We may have bouts of illness or looking for a diagnosis to an unknown health problem. An illness that may have a long hospital stay with complicated procedures. Hopefully, "just once"! When we think we only have to do something "just once," we can look at it with a clearer vision. It makes the unknown less ominous. We become so grateful that it is only a "just once" event. We may only have one more time to see the doctor, one more time to meet with the lawyer, make one more payment to delete the debt, make one more phone call to arrange one more visit. This does not eliminate what has to be done, but eases the mind when doing so. We know it is almost over, almost done. Our health and mental welfare depend on our perception of what is happening. We also are offered the choice to have a "just once" define us. Some wear a tragic struggle as a badge for living and stay in the muck for longer than necessary. Others just add the situation to the life story and move forward. We may do both in the litany of life obstacles. We again have a choice in which we choose to linger or move forward. We all know people who love to stay "stuck" in a past betrayal or something tragic. It truly is easier to have something keeping one unhappy than to stand up and give ourselves the time and effort to move forward to a better place of contentment. Which do we choose? When the "struggling juggling" time is over (and it will be), you can say, "I never have to do that again." Be at peace that you showed up and did your best. Right here I stop. For those who are doing "caretaking" or healing from something, do not be angry at those who did not show up or call or offer or stop by or send a card or just vanished. I suggest you let them be. Hard to do, letting the ones who did not show...GO. Rid your bad feelings about them from your mind, from your thoughts. Do not pick a fight with the no-shows. No demanding questions like "Where have you been?" Better yet, "Who are you not to show up?" They know where they were and why. The ones who showed up, you honor and tell them you are grateful for their presence and assistance. We really never know what is in store for us and we don't know what is in store for them. Sometimes we get to see the cause and effect of others' poor choices. Most times we will never know that their awful behavior caused an unhappy outcome. But know everyone has that "something," as my grandmother would say. Which means someday they will have "something" big in their life that they have to handle. It is HOW we deal with such burdensome ordeals that builds us the life we live. We build our best life with our daily choices. A burden to one is an accepted challenge to another. Our choice. Knowing we have to do something "just once" takes the sting out of it. This way of thinking may make you more organized and determined to not go down the road of self-pity or depression. Why waste your time when something is not forever? Really, what is? However, at the start of a "just once," there will be shock, tears and fears, anger and thoughts running amuck. What has happened that such responsibility has arrived in our lives? Soon enough we face the reality of what is. We need all the energy to make that next phone call and cannot afford to be drained by any outside influences. I am always amazed that when I let a bad situation or person go, I am always sent a better solution or help. Why? I think acceptance of the best will draw the best. So, do not clutter your thoughts with someone else's odd behavior, the clutter of who is disappointing or hard to deal with. By doing this you are accepting less. Is this easy? Never. On the lighter side, here is a simple example of recognizing what works and what does not in a stressful "just once." When caretaking my parents, it was at my childhood home loaded with childhood memories. One memory was of our local Italian bakery, Vaccaro's. My dad would bring home their jelly donuts as a treat. So, when visiting my folks, I would go to that bakery for a supply of jelly donuts. I ate the donuts, I ate lots of donuts. Jelly donuts with powdered sugar. Lots of them. I must say this did not work. Extra weight is never a lovely thing. It is also our choice how WE want to be when the "just once" ends. Would we want to struggle with extra weight, which breeds frustration? Always our choice. Remember when the event is over (and it will be), we get to live a new way. How will that be? Mad? Angry? Unhealthy? Unhappy? Regretful? Your choice. I eventually throttled back on the donuts. More than once, on driving home from a day with my parents, I had the feeling of being so overwhelmed. How will I clear the house, move my mother, handle the passing of my dad? How? By clearing one kitchen drawer at a time or making one more phone call to set up something, or get the answer to something. To this day, when faced with what appears a large obstacle, I look at the big picture and say, "One paragraph at a time to finish the one chapter to finish this book four." You don't write a book in a day nor clear a home out in an hour. It takes discipline and tenacity and our newfound wisdom to know one step, one call moves us forward. Some days nothing gets done, but that is fine. We know that next day we get the choice of another closet or box or drawer or appointment, all in the course of moving forward to the best for ourselves. On the other side of the coin, you may be the person who has never been "called up" yet. What does "called up" mean? In our family, when we hear that a person has had something unusual happen that they must handle as an individual, we call it "Called up!" Called up to serve another, called up to show up, called up to handle, called up to be present, called up to grow up. You got the call and you're now front and center in something, you have been "called up." You also may have a chance to be a visitor to a sick or dying friend or loved one for the last "just once" visit. Make the visit. Do it for the person or do it for yourself. Knowing you only have to face this "just once" takes the fear, hurt or anger out of the circumstance. You only may get one chance to say goodbye or make a one-time offer to assist in some small way. As an outsider, be kind and compassionate. The right thing to say is to ask, "What can I do?" "How can I be of help?" "What do you need that I can get you?" Tell them if they don't know today, but may think of something, please call upon you and leave your number. What a perfect world that would be! Now if you have indicators that you can't or do not have the wherewithal to help, say nothing. In the "just once" challenges of life may be your own personal health. Gather the best care for yourself. Choose the best people to go the course with you. Sometimes the choice will be surprising. Who you thought would show up doesn't, and who you wouldn't think, does. Life is so interesting. Be open to the surprises. Kindness of others is always waiting to be accepted. How you handle your "just once" is as individual as we all are. Don't be bothered by others trying to give you advice about things they know nothing about. Keep your time limited with those kind of people. They may be giving advice that is not the best fit for you or your person. They may call you up and tell you what should be done. You don't have to listen. Phone away from ear, let them talk. They may think by giving their view they are helping. Meanwhile you are the one with facts and figures on what is happening. Just say, "Thank you for your input" and move forward your own way. I would get angry or be hurt and think, "Don't they think I thought of that point already?" I found this was exhausting. You need to keep up your own pace and not be dragged down in a muck of bad feelings from any unnecessary advice given. One of the hardest things is not ever knowing how long the "just once" lasts. That is why we must stay calm during this time. Anything that will keep you calm and clear to make the decisions that have to be made, you should embrace. To stay calm to move forward for the best for all involved. This, again, comes with the acceptance of what is. I accept this situation now and don't fight going through it. Being in a "just once" like caretaking or being ill is like peeling an onion with so many layers. And on the days when our "just once" situation eases up a bit, be so very grateful. Gratitude will fuel us to move forward. So while we are going through this event, we can at times put some distance and a detached view of "just once" thinking. Keep our thinking clear by saying to ourselves, I only have to make one more move, have one more surgery or make one more decision. If I have go through one more ______ (fill in the blank) to get to the other side for a more healthy body, maybe better mobility or a new freedom to find someone better suited for us or to live in single bliss after a divorce- our choice for our new normal-the daily drudgery of daily physical therapy, FEMA details or a call to the lawyer is not fraught with so much anger but with a calm acceptance. That is our main goal: to stay calm, to stand strong. To keep our peace to make our best decisions and follow our best direction at all times. Sometimes changing the direction or decisions happens in a moment. Your view of what is happening is a gift to yourself. This gift will build your self-reliance. And when our "just once" ends, it is up to us to remember what was helpful and then help another. We will reach out and ask and offer and mean it. We will show up if possible. If we can't, know that is also being self-reliant. Our self-reliance includes our best self-care. To best move forward with the next new action to smooth the way, we will take a big, deep breath, knowing we only have to handle this "just once."